Legends tell of a great battle waged between Mira the Earth Goddess and Doma the Demon God on the continent of Valencia thousands of years ago. After the battle, the continent was divided into Sophia in the south and Rigel in the north. But now, Emperor Rudolf of Rigel has put in motion his plans to rule over all of Valencia. 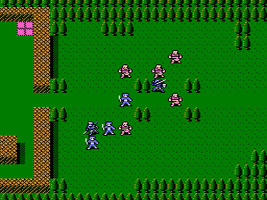 Maisen, a Holy Knight of Sophia, has been raising an army in the village of Lum to face the armies of Rigel. A young man named Alm is showing exceptional promise and leadership. Meanwhile, on an island far to the south, a girl named Selica plans to make a pilgrimage to Mira's Shrine because of all the problems in Valencia.